A few years ago, I was on a journey to ensure that my 4th graders mastered their multiplication facts. As a 5th grade teacher, I always appreciated it when 5th graders came to me with a strong grasp on their multiplication facts, but I also had my own 4th grade reasons to ensure that my students improved in their multiplication fact fluency. As I wracked my brain to figure out what would help my students, I came up with a solution to target their ability to actually think about the connections between different multiplication facts and to develop greater number sense understanding. 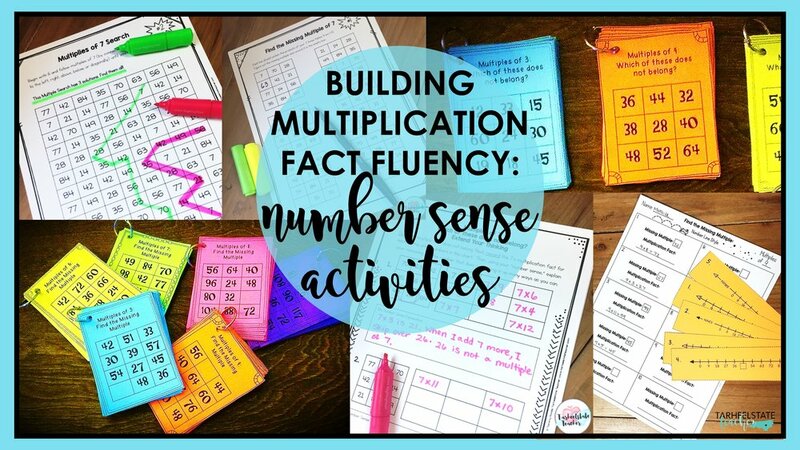 I hope you enjoy reading about my journey and pick up some new multiplication fact fluency activities that you can use! Multiplication fact fluency is SOOO important for students’ continued math success. Students who know their multiplication facts are more confident when learning a new skill. I know what you are thinking (perhaps)--give those students a multiplication fact chart that they can refer to! That’s a great modification, but is a multiplication fact chart a "forever" solution? I was on a mission to help multiplication facts CLICK for those students who were struggling AND to help them harness the confidence of being successful! (So, I wasn’t ready to give them a multiplication fact chart and “call it a day.”) I wanted students to know their multiplication facts with fluency and automaticity--no tricks, no fingers, no count-by's down the side of their page--just pure and simple automatic fact recall—but I learned, this was expecting too much too fast for some of my students if I did not target the skills they were actually missing. Being a 5th grade teacher at heart who was teaching 4th grade at the time, I know how critical multiplication facts are to success in math and future math learning. I know that students who know their multiplication facts have an easier time learning how to multiply and divide larger numbers, how to recognize fractions that need to be simplified, notice patterns in numbers, and use algebraic reasoning. Other concepts that are embedded in knowing our multiplication facts include prime, composite, common multiples, finding common denominators, and divisibility. Needless to say, those facts are important! So, how did I come about designing “count-by” activities to target deeper number sense understanding and greater multiplication fact mastery? One day during math, I watched a student who struggled with her multiplication facts write "4 x 9 = 37"…and it hit me smack in the face...this student doesn't even realize that all multiples of 4 are even! This student was lacking in number sense that I took for granted and perhaps has not had the opportunity to discover the "obvious to me" patterns in multiples of 4. This student also didn’t know that 4 x 9 is like (4 x 10) - 4. I’ve also experienced students who count-by to get to their facts (which is totally acceptable to me), but their count-by strategies aren't efficient and lack in number sense understanding. For example, a student who counts by 6’s to find 6 x 4 might sound like this, “6, 12, 18--19, 20, 21, 22, 23, 24--24...what was I doing again?" This student doesn't realize that they can count by 6's with the multiples they know by heart (6, 12, 18) and then add up in groups of 3 and 3 to get another 6. It’s important that students have efficient strategies for counting up to multiples they do not yet have memorized. As I mentioned before, it became my mission to come up with a solution to help these students develop better number sense and in turn, improve in their multiplication fact mastery. I even spent time researching memory and why people struggle with memorization. I was desperate for something fresh that would help my students! Somewhere in my research, I read that to master multiplication facts, students need lots of experiences with "county-bys." I follow Donna's Boucher’s website and blog at Math Coach’s Corner and came across this blog post that suggested a "Count around the Circle" activity. That sounds great for the younger grades. I read that idea wishing my students could go back in time and have that circle experience, but I couldn't see myself getting my whole class to sit in a circle and productively play this game when only about 5 of my students really need it. I realized that a handful of my students needed a separate intervention focused on “counting-by” and number sense rather than directly targeting the memorization of multiplication facts I was hoping for. I decided that it wasn't just more multiplication fact practice with flashcards and games and rhymes that these types of kids needed---it was more opportunities to work with "counting by," multiples of numbers, and looking for patterns in fact families to develop greater number sense. Out of this realization, grew my Multiplication Number Sense Intervention Tasks—fun, meaningful ways for students to look for number patterns and practice “count-by's" so that they become more “number sense savvy” and efficient. Which of these Does Not Belong? (formatted as task cards to place on a ring): Students use their number sense to figure out which number in the grid doesn’t make sense for a given multiple—maybe a number is too close to a multiple students know belongs to the family, maybe it is an odd number and should be even, maybe it does not have the correct number in the ones place, etc. Which of these Does Not Belong~Extension Pages: I also formatted the “Which of these Does Not Belong” activity into a student journal page that is perfect for guided groups and intervention groups. These journal pages extend students’ understanding of which multiple does not belong as they have to explain and justify why the number is not a multiple of the fact family. As I support students in explaining their thinking using mathematical number sense, I find that they get better and better at developing awesome explanations. In small groups, I see a lot of growth as students hear insights from other group members. 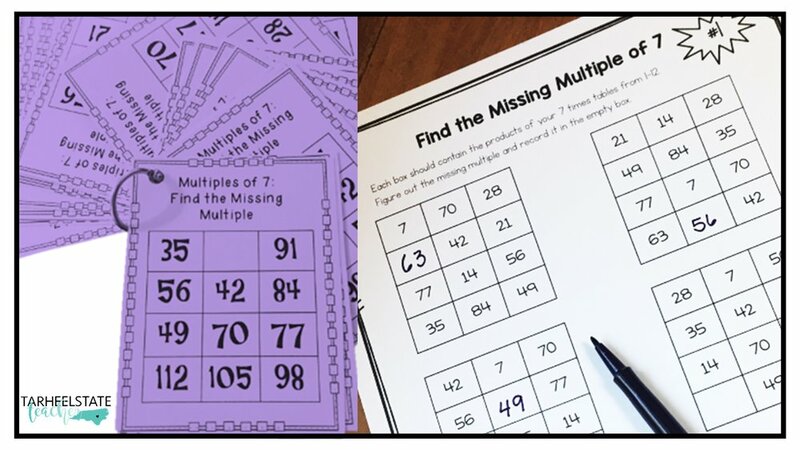 Find the Missing Multiple: The Find the Missing Multiple activities (also formatted as task cards) force students to "count-by" for a purpose— to identify a multiple that is missing in a string of multiples. Students become more efficient in noticing whether or not the next multiple is in the chart. I used these cards a lot in hopes that it would break students from counting up to the next multiple one-digit-at-a-time. Multiple Search: This number sense activity is like a word search, but instead of finding words, students “count-by” to find strings of multiples from the 1st multiple in the fact family all the way to 12th. I found this to be an age-appropriate, fun way for students to practice a set of count-by’s independently. Within one multiple search, I included three strings of the multiples. 120’s Charts: I also thought that having students look at multiples on 120’s chart (something that should definitely have been a part of their lower-grades math experiences) would be extremely beneficial. I wanted students to spend more time analyzing patterns in multiplication fact families so that they would have greater opportunities for “ah-ha!” moments (like all multiples of 4 are even!). This is another activity that is perfect for small group lessons so that students can share their insight and you can point out any important “number sense” patterns students should have picked up on. I took all of the "Find the Missing Multiples" and "Which Multiple Does Not Belong" activity cards, printed them on a different color of cardstock for each number set, cut the cards apart, and put each set on a ring. I scheduled time to meet with my Multiplication Intervention group for 15 minutes 3 or more times a week. I met with students during one of their stations or while other students were completing task cards. I prioritized this group because I knew that their math success and confidence was dependent upon gaining better number sense. I also wanted to train students in how to use the activities in small groups so that I could assign number sense activities as differentiated station work for them in future weeks. This allowed me to meet with them to discuss their findings and go over answers versus using small group time to teach them how to engage with the activities. Students who are not mastering their multiplication facts need to develop greater number sense and to increase their "count by" speed and ability. The more practice you can allow your students, the better. I offer my students opportunities to complete same activities again and again until they are comfortable with the multiples of a specific fact family. I believe that helping students learn multiplication facts doesn’t have to continue to be a struggle! It can be fun and help them develop KEY number sense concepts that allow them to develop greater understanding of how their multiplication facts are related! Be sure to catch the other posts in the multiplication facts mastery series! 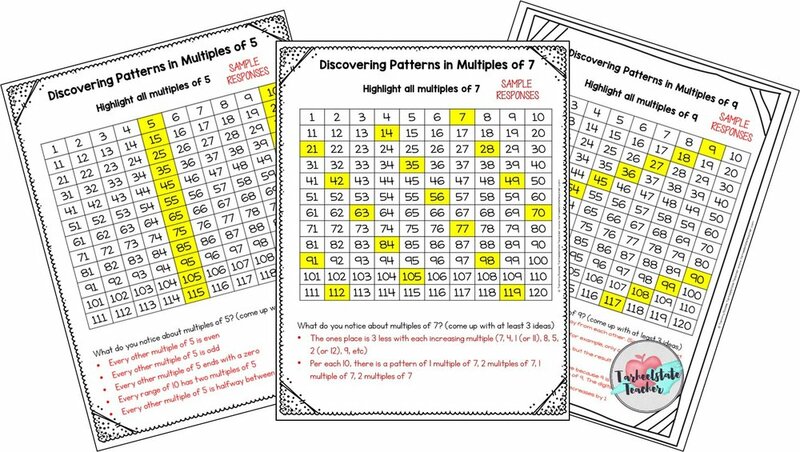 In this post, I share patterns in multiples of every multiplication fact family 2-12 and how I guide students to look for patterns in the multiples of multiplication facts using a 120’s table. This helpful list will support you as you guide your students to think about patterns they see, engage them in math talk, and aim to improve their understanding of multiplication facts. 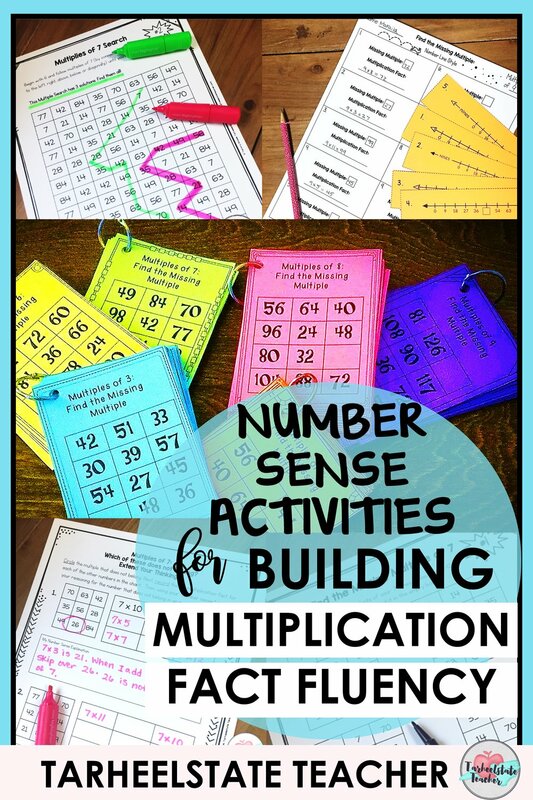 Share your email below to get the Multiples of 7 Number Sense Intervention activities!